Layered with crumbled tofu and plenty of spinach, this recipe for a vegan, cheeseless tofu lasagna is hearty and flavorful. 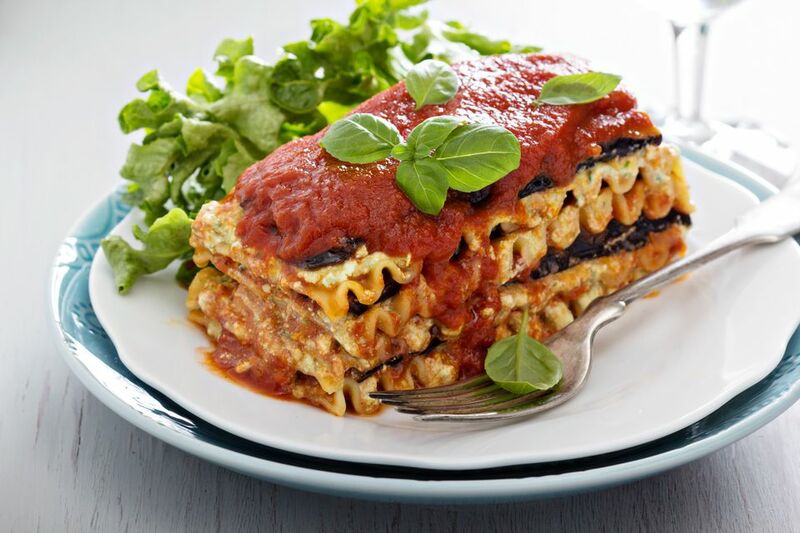 No cheese means this vegan lasagna recipe is completely dairy-free and cholesterol-free and much lower in fat than other traditional lasagna recipes. Silken (soft) tofu: What to do with it? Drain carefully and set aside on a towel. Place the tofu, sugar, soymilk, garlic powder, lemon juice, basil, and salt in a food processor or blender and blend until smooth. Cover the bottom of a 9-inch by 13-inch baking pan with a thin layer of tomato sauce, then a layer of noodles. Follow that with a layer of half the tofu and half the spinach. Continue in the same order, using half the remaining tomato sauce and noodles and the rest of the tofu mixture and spinach. End with the remaining noodles covered by the remaining tomato sauce. Bake for 25 to 30 minutes, or until tomato sauce bubbles.